Software vendors, hospitals and clinics, labs, care facilities. Financial companies from banking to lenders and brokerage firms. From large insurance carriers to agents and brokers and more. For federal government agencies, and local and state organizations. Manufacturing companies for PO processing and document sharing. For HR forms, transcripts, receiving applications and student records. As Gmail turns 15 years old, a great deal is being written about the impact email has had on the productivity of today’s work environments. But what’s incredible is that so many businesses in the healthcare, financial services, manufacturing and education sectors, as well as government agencies, still rely on a far older form of technology — the facsimile or fax, whose beginnings date all the way back to the middle of the 19th century. Other aspects of companies’ IT infrastructures have undergone major advancements, such as migration to the cloud for a wide variety of services including data access and storage. However, the fax machine is often left alone — allowed to continue its operation as a piece of legacy equipment without much thought on how to better streamline and/or improve the faxing process. Ask just about any business that uses faxes why it still depends on this form of technology. The answer will most likely have something to do with faxing being a legal, secure form of sending and receiving vital documents like healthcare records, loan applications and time-sensitive contracts. And that’s mostly correct since fax logs are recognized as a legal form of proof that information was either sent or received by a fax operator. But there are also some glaring slips of logic and economics in the answer. To operate correctly, traditional fax machines require ink, toner, paper and loads of monitoring and maintenance. This combination adds up to significant ongoing costs that most businesses simply accept because they haven’t looked at an alternative to conventional faxing. The truth is, it’s worth taking a careful look at what cloud-based fax service is all about. This more contemporary form of faxing can forever change the playing field for companies that want to continue faxing while simultaneously improving the entire process for the advancement of the enterprise. What Is a Cloud Fax? 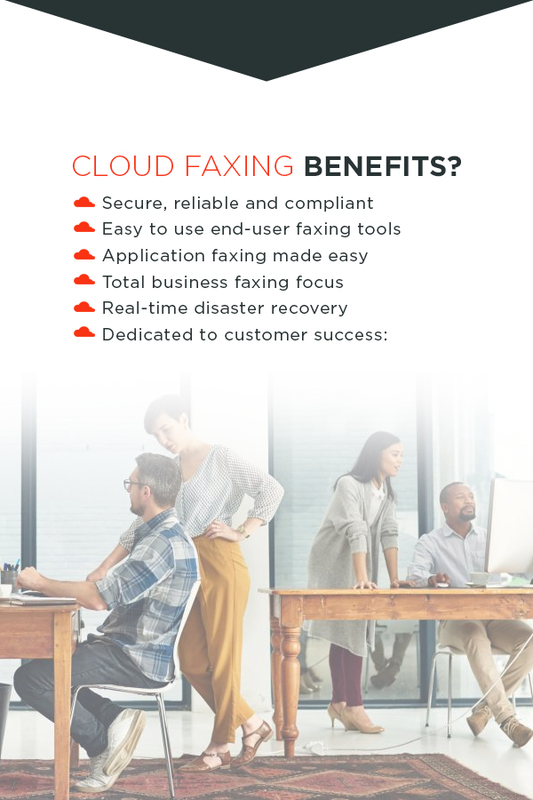 While a corporate cloud fax service might sound like an unproven or untested form of technology if you’re unfamiliar with it, cloud-based fax solutions — like the one from Softlinx — are actually extremely reliable, and they can save businesses a significant amount of time and money. In essence, cloud faxing is a new method of faxing that relies on a cloud-based service in place of legacy fax machines. Instead of using outdated fax machines and analog phone lines to transmit and receive data, a cloud fax solution transmits documents digitally. Just like you have digital options for how you access your business’s data, you also have options for how you carry out your cloud faxing. “Cloud faxing” is an umbrella term that includes options for online faxing, faxing via email and even internet faxing. You can think of it as a comprehensive evolution in faxing technology. Now, with all the freedom to send and/or receive faxes from other businesses’ traditional fax machines, you can enjoy a truly 21st-century process that brings secure faxing capabilities to practically every connected device you might use. No longer restrained by the limitations of legacy fax machines, you’re free to take advantage of our Softlinx solution that allows you to send, receive and read faxes via our easy-to-use software and mobile application. Say goodbye to the days of having to stop your workflow and walk to a fax machine to transmit or access data via fax. With cloud faxing service from Softlinx, you can use our web portal or email program for all your faxing needs — and retire your outdated fax machines and all the costs and hassles that go along with them. Instead, with the same ease and convenience of emailing, you can now fax as well. While email has been swiftly adopted as a form of day-to-day communication for many businesses, faxing has remained a leading form of legally binding communication. You can test this theory by looking at the most recent four or five faxes your business has received and seeing what type of information is contained in them. Typically, unlike emails that can be informal and interspersed with ads and marketing campaigns, faxes are reserved for important information — like purchase orders, patient test results and signed contracts — that businesses rely on to conduct their operations effectively. In understanding how to use online cloud faxing, it’s helpful to look a bit more in-depth at what the term “cloud faxing” means. The combination of two distinct technologies is what cloud faxing is all about in its broadest sense. The idea of the cloud — or a virtual hosting solution where remote servers allow users to access, store and process data without the need of on-premise servers — is gaining traction with companies seeking scalable solutions for their data management needs — solutions that won’t overtax their IT departments. The acceptance of cloud computing is supported by the fact that the International Data Corporation — or IDC — reports that worldwide spending on cloud computing services will continue to grow at six times the rate of IT spending through 2020. Another way of looking at the dramatic rise in the commercial adoption of cloud computing solutions is that in 2015, the global spend on cloud computing services was approximately $67 billion. Yet by 2020, that annual amount is expected to swell by nearly 2.5 times to $162 billion. Clearly, with statistics like these to demonstrate its growing popularity for businesses, cloud computing — and the services it supports — will only continue to grow for the foreseeable future. In combination with the term “cloud,” the definition of “fax” remains largely unchanged. Since any development in faxing technology still has to work with legacy fax machines for businesses that continue to use them, the end result of faxing — whether over analog telephone lines or digitally transmitted — will need to remain as secure as ever. The key difference in online cloud faxing is the ease with which users can send, receive and access fax transmissions — once cumbersome fax machines have been removed from the equation. Now, with cloud faxing, when you want to send a fax, it’s as easy as attaching a document or sending an email. In much the same way you use a webmail service, faxing online is as simple as selecting the documents you want to fax and uploading them via the Softlinx solution. From there, your documents are encrypted and transmitted so that your intended fax recipients can receive your faxes — even over phone lines supporting legacy fax machines. It’s simple, economical and above all, secure. What Is a Secure Fax? Secure faxing is a more reliable variation of normal faxing, sending documents to or from more stable sources over an encrypted transmission link and using a secure cloud fax server to keep your data safe. Softlinx provides a cloud-based fax service with secure data encryption that protects both your incoming and outgoing faxes as they’re stored and sent through our servers. How Does Cloud Faxing Work? Imagine being able to increase the level of security of your communications while simultaneously reducing the time and effort it takes to send faxes. That’s what cloud faxing can do for your business — and here’s how it works. Depending on the needs of your business, you’ll set up one or more virtual fax numbers that can be specific to certain aspects, personnel and departments within your organization. Of course, the option to set up virtual fax numbers is scalable, so you can add numbers and related services as your business and commercial needs grow. As a sender, you can send a fax by attaching the documents in question to an email with a message. The documents can be scanned pieces of paper, or they can be created using a program such as Microsoft Word. Next, you address the fax message with your intended recipient’s fax number — as well as the name of an online fax service if they employ any. Once you’ve submitted your fax for online transmission, the Softlinx solution translates the documents in question so that they can be read by any fax machine at its intended destination. The fax is then sent over the transmission line of choice for the recipient. Finally, the recipient’s fax technology — whether an automated service or legacy machine — receives and decodes the documents you sent. A sender — regardless of the method of fax technology being employed — assigns your virtual fax number to the fax they want to send. The sender’s fax transforms the data into a fax transmission over either phone lines or via online digital methods. Once it’s received by the Softlinx solution, your incoming fax is translated into an image file, which is then sent securely to your email address. When you’re ready, you can open the email message with your incoming fax attached and ready to be viewed, shared and stored as any secure file would be. How to Send a Secure Fax? For an even clearer understanding of how Softlinx works, consider how simple it is to send a secure fax online. With our intuitive cloud-based fax solution, you can submit outgoing faxes online directly from your business applications using Softlinx fax APIs, email, web portal or Windows desktop print-to-fax client, or from a multi-function printer (MFP) for a paper-based document. These are submitted over a secure, encrypted communication link directly to the Softlinx secure fax service so your faxes are secure. As for inbound faxes, they are processed and encrypted in the cloud fax server before delivery. 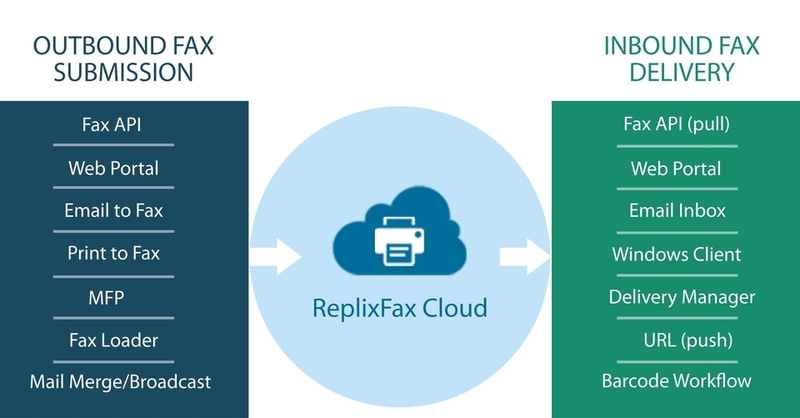 Your incoming faxes are then delivered directly into your business applications using Softlinx fax APIs, email inbox or shared network folders behind your firewall. You may also login to a web portal or Windows fax client. With the Softlinx secure business fax solution, you no longer need to worry about secure sent and received faxes. Softlinx Cloud Fax Service offers a secure and reliable online faxing alternative for your business. You can submit faxes directly from your application or via email or the web and take your inbound faxes into your email inbox, shared network folders or your system. With the Softlinx cloud-based fax service, you can benefit from a streamlined document workflow process and save costs. To learn more about how simple it is to switch to our cost-effective, secure cloud-based fax service, contact us today to schedule your live demo. Or for answers to all your online faxing questions, call us directly at 800-899-7724. Why Softlinx Cloud Fax Service? Softlinx cloud fax service is HIPAA and PCI DSS compliant supported by encryption during transmission and while “at rest” in the cloud, which is hosted at an ultra-reliable data center audited by AICPA with SSAE-16 SOC reports. Softlinx offers a full set of user-friendly faxing tools including Email to Fax, Print to Fax, Web Fax and MFP support, and an intuitive web portal to support your business’ online faxing needs using your preferred faxing method. Softlinx offers fully-featured cloud fax APIs with sample code to help your organization more quickly fax-enable your business applications. Softlinx also provides test fax server and full technical support during implementation period. Our service is exclusively designed for business users to streamline fax document workflow processes. We offer extra fax automation tools for folder faxing, electronic filing, metadata passing and barcode fax workflow. Softlinx service at our primary data center is replicated in real-time at a remote disaster recovery site to ensure your business continuity in case of disaster and to meet our recovery time (RTO) and recovery point objectives (RPO). Softlinx’ dedicated U.S. support team provides first-class 24×7 support for customer success. Softlinx guarantees the best, with a service level agreement (SLA) for prompt problem resolution and 100 percent customer satisfaction. Learn more about how Softlinx can help, contact us at 1-800-899-7724, sales@softlinx.com or fill out our form to Get a Quote.